Tilt steering allows you to adjust the steering wheel before you drive. You can also raise it to give your legs more room when you exit and enter the vehicle. The steering wheel should be positioned so that it is comfortable for you to drive, while permitting you to see the instrument panel warning lights and gauges. Never adjust the angle of the steering wheel while driving. You may lose steering control and cause severe personal injury, death or accidents. After adjusting, push the steering wheel both up and down to be certain it is locked in position. 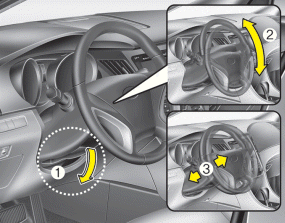 To change the steering wheel angle, pull down the lock release lever (1), adjust the steering wheel to the desired angle (2) and height (if equipped) (3), then pull up the lock-release lever to lock the steering wheel in place. Be sure to adjust the steering wheel to the desired position before driving.